Aretha Franklin at the Kennedy Centre Honours 2015. It’s all about the clutch purse. 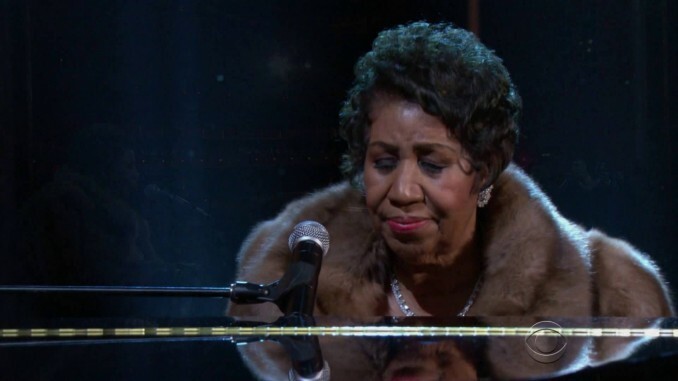 Aretha Franklin is so relaxed about delivering this ridiculously brilliant performance that she casually walks out to the piano with her purse. She plops it down, starts playing and blows everyone away. I can’t think of the last time a living legend in their early 70s went viral. And this isn’t the hyperbole of “gone viral!” that’s often written about online clips yet to go even minor cough or sniffle. Aretha Franklin. Just the name evokes thoughts and images of regality. And if the name didn’t do it then the clutch purse and the semi-contoversial long coat ought to have. The function was the Kennedy Center Honours in Washington DC – an annual celebration of performing arts that sees five inductees celebrated in front of their peers and the President. Recorded December 6th and broadcast in the US on December 29th, this year songwriter Carole King was honoured alongside filmmaker George Lucas, singer Rita Moreno, broadway performer Cicely Tyson and conductor Seiji Ozawa. With the purse placed on top of the piano, Aretha begins to play. You see Carole King gasp at the realisation one of history’s greatest singers is about to not only sing one of Carole’s songs, but play it too. Again, the self-assuredness of Aretha is there in the opening notes on the piano keys. It’s a reminder that she could really play piano and oddly for me, also that her piano skills enabled her to write some seriously good songs herself. 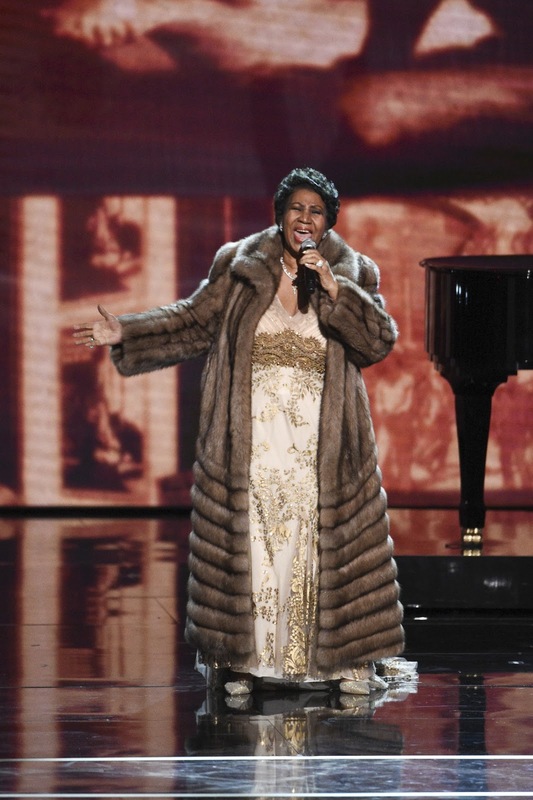 The dress, the coat – Aretha Franklin. But this is a song of Carole Kings’ and the glory of the complicated triumph of American music is right there to behold: a white woman who wrote a secular gospel song so good that the finest black gospel singer on the planet decided to record it. The first vocal is remarkable: “Looking out… on the morning rain…” and Carole King’s jaw drops. The warmth, the sincerity and once again, the self-assuredness is all there. For Aretha Franklin at 73 to still sing with this kind of beauty and emotional power is enough for President Obama to be seen wiping tears almost instantly. By the time Aretha steps up from the piano and removes her coat for the song’s finale the crowd are cheering and on their feet.